Hiking in grizzly bear country is always an adventure. Just knowing there is a predator out there that is bigger and stronger than you adds an edge to a trip, even though the likelihood of a dangerous encounter is extremely remote. I’ve hiked thousands of miles solo in grizzly country and only ever seen three bears, though I’ve seen plenty of bear sign (and reacted accordingly). Two of the bears were spotted at a distance (one of the reasons I carry mini binoculars – is that a tree stump or a bear on the far side of the meadow?) so I changed my route without going near them. Just one bear was relatively close – a few hundred feet away, which seems no distance with a grizzly bear – and coming towards me. Nothing dramatic happened. I made a noise. The bear sniffed the air, changed direction and disappeared into some willow thickets, leaving me feeling elated and scared at the same time and privileged at seeing the bear wild and free in its wilderness home. There are many books about grizzlies. Too often they paint the bears as killers and monsters and humans as victims and heroes and have little to do with the true nature of bears. The books of Doug Peacock are an exception. For many years Peacock spent months at a time living alone in grizzly country studying and filming the bears. His first book, Grizzly Years, tells the story of those trips and is one of the best natural history and wilderness adventure books I have read. In The Presence of Grizzlies, written in conjunction with his wife, journalist Andrea Peacock, looks at the relationship between human beings and grizzly bears and why it is of value and why the continuing presence of bears is necessary. The book discusses fear of bears and how to act in grizzly country and has interviews with photographers, hunters, bear keepers, conservationists and others involved with grizzlies, including survivors of attacks by bears. Interspersed with the interviews and facts are fictional stories of individual bears, bases on grizzlies Doug Peacock encountered. These tales are wonderful and whilst of course no one can know how the world looks from the perspective of a grizzly bear or how a bear thinks Peacock can undoubtedly come as close as is possible. His knowledge of the natural history of grizzlies and the pattern of their lives means that the stories fit with how wild bears actually behave. This is a powerful and moving book, well written, enthralling, enlightening, informative and inspiring. Ignore the sensationalist bear books. This is the one to read to learn about real bears and our relationship with them. 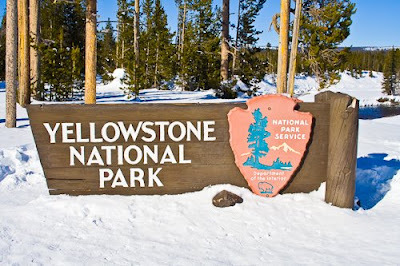 Photo info: Yellowstone National Park is one of the few areas in USA outside of Alaska where grizzlies are still found. Canon EOS 350D, Canon EF-S 18-55mm@28mm, 1/400@F8, ISO 100, raw file converted to JPEG in Lightroom 2.